Do you need to move or buy a bigger apartment? If time is of the essence, the following article will teach you how to sell a co-op fast in NYC. We’ll show you how to sell your apartment quickly with or without a broker. This is the fastest and most convenient way for you to sell a co-op fast. However, it’s important to note that you can cut down on high closing costs involved with selling a NYC co-op by hiring an experienced, full-service broker for only 1% commission. Best of all, our brand name partner brokers are highly experienced when it comes to selling coop apartments in NYC quickly and often above asking price! A full-service broker will upfront the marketing costs involved with selling your property. If you want to know how to sell a co-op fast, then this is the absolute fastest way to get your co-op sold. A full-service broker will immediately order a professional photographer and a draftsman or architect to visit your home. You will typically receive digitally re-touched photographs as well as a newly drawn floor plan within 48 hours of the visit. Because a broker will have a roster of professional photographers and draftsmen ready to go, they can typically get a photo-shoot scheduled the very next day after you sign an Exclusive Right To Sell Listing Agreement. Pro Tip: Be careful of traditional listing agreement language which may compel you to pay 6% commission as long as a “ready, willing and able” buyer is found at your listing price! Please read our article on can a seller back out of an accepted offer to learn more. Any listing will sell at the right price, regardless of who is listing the property. This was recently admitted by the CEO of Douglas Elliman at a NYC real estate conference. Because your broker will upfront time and money to market and show your property, they will want to make sure you have a realistic listing price. As a result, you and your full-service broker must mutually agree on an initial listing price. Your broker will be incentivized to price it low so he or she can sell it faster and more likely collect a commission. You will be incentivized to price it high because you want maximum proceeds. You will have to meet in the middle at a realistic, market clearing price. This step seems self-evident, but many home owners seem to think it’s okay to only make their home available for showings when it’s convenient for them, perhaps for a couple of hours during an open house on the weekend. This is a recipe for disaster and will likely result in your home becoming stale and sitting on the market for too many days. 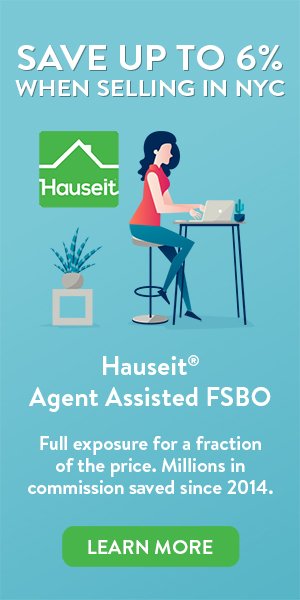 Pro Tip: You can reset your days on market simply by relisting your home in NYC through an Agent Assisted FSBO. It is possible to do so as many times as you want. This is an especially risky maneuver for luxury homes priced over $10 million where the buyer base is considerably smaller and almost entirely represented by luxury real estate agents. Much of the buyer base for luxury priced homes will be from overseas. These international, typically all-cash buyers will often only be in town for one or two days. As a result, it’s not uncommon to hear from a buyers’ agent a request to see your listing at one specific time and day. When you push back, you will often hear that is the only time available as their day is packed with other showings already. As a result, we’ve seen instances where sellers of multi-million dollar properties have pushed back on showings either because they were away for the weekend or because they couldn’t take time off to show during the work day. As a result, they missed the few international buyers that would have been able to afford their property. You should hire a real estate attorney as early as possible in your sale process. Ideally, he or she could even review the exclusive listing agreement before you sign with a broker. This is especially important if you’ve chosen to pay up for a traditional full-service broker. If you want to sell a co-op fast, you’ll want a contract of sale already drafted and ready to send to the buyer’s attorney before you’ve accepted an offer. This way, you can have your attorney send out the contract as soon as an offer has been accepted and a deal sheet circulated. This step is easy if you’ve correctly priced your property. It’s almost a certainty you can have this kind of power as a seller if you’ve slightly under-priced your property as you will be facing multiple offers. As a result, because you have multiple interested parties you can demand the buyer to expedite the contract diligence and signing process. Note: while not recommended as it may cause offence, some sellers in hot markets have sent out contracts to multiple buyers. This way, whoever signs the contract first with the best price will get the deal. Remember, nothing is final in real estate until a contract is signed by both parties! A good real estate attorney will negotiate the contract for you in such a way that there are minimal chances that the buyer can just walk away. This may mean negotiating the financing contingency clause or appraised value contingency clause in your favor. What is a financing contingency clause? This is language in the purchase contract which typically gives the buyer the ability to walk away from the transaction with his good faith deposit if the buyer is not able to secure a financing commitment from a bank within a certain amount of time post contract signing. What is a loan amount contingency? Because banks will only lend against the appraised value of a home, the appraisal is very important for buyers seeking financing. The appraised value may be the same, higher or lower than the contract price. If it is lower, the buyer may be in trouble because the bank will lend less than anticipated and the buyer will need to make up the difference in additional equity. As a result, many buyers’ attorneys will attempt to insert a loan amount contingency which states that if a buyer does not secure a certain amount of financing, then the buyer can freely walk away with their good faith deposit. This may not be a great outcome for sellers since you cannot control what value the appraiser will come up with. Note: Your lawyer will advise you on contract negotiations. Hauseit does not provide any legal, tax or investment advice. The information presented is not legal advice, is not to be acted on as such, may not be current and is subject to change without notice. A co-op board is essentially a board of directors of a corporation that owns a building. As a result, the co-op board has an extraordinary amount of power over its shareholders (i.e. the shareholders / apartment owners). A co-op board has complete discretion over whether to approve a buyer. If a buyer is rejected, the board has no obligation to disclose reasons for rejection. As a result of this opaque power structure, it’s much easier to just be on the board if you’re about to sell your apartment. Ideally you knew well ahead in advance that you are planning to sell so you’ve campaigned to get elected to the board in advance. This way, you won’t have to worry about co op board approval! Note: if you aren’t on the board at the time of your sale, ideally you are at least friends with the board members. If you have enemies on the board, it may be problematic for you. The board can reject your buyer as many times as they want! You want the buyer to be approved the very first time. This will save you the hassle of waiting for the buyer to re-submit an application or having to restart the sale process and find a new buyer! You know the board better than any other party in the transaction, so please share with the buyer what the board is like and how to behave at the co op board interview. Is the board relaxed? Will they ask any particularly hard to answer questions? These are all good things for your buyer to know. In terms of the purchase application, some boards are stricter than others. Some boards will be very relaxed and not be overly demanding or nit picky of errors, formatting or spelling mistakes. Some boards may not even bother to read the entire application! Other boards will be extremely thorough and read every last single word. Only you and possibly your listing agent will know this in advance. Therefore, as a courtesy please remember to convey expectations in advance to your buyer. Note: As a general rule, it’s best for the buyer not to ask any questions at the board interview. They should say they have no questions even if the board asks them at the end of the interview whether they have questions. There have been cases of boards asking whether the buyer has questions at the end of the interview simply as a test of whether they will be difficult future shareholders. If you’ve followed all of these steps on how to sell a co-op fast, then you should hear from the building management within a few days of the board interview on whether the buyer is approved. Once approved, you or your agent should notify the attorneys and the lender so that a closing date can be coordinated. Your agent will schedule a final walk-through for the buyer usually the day before closing to make sure the apartment is still in the same condition as when the buyer previously saw it. So it’s quite clear that if you want to sell a coop fast you should hire a broker; however, what if you can’t afford to pay the broker commission? In this segment we’ll show you how to sell a coop by owner and avoid paying even one percent in real estate agent fees. This first step is significantly different if you are hoping to sell a co-op by owner. You will still need a broker to access the RLS broker database so you can offer commission to buyers’ agents. However, you can do so these days for a very minimal, one-time flat fee. Hauseit will pair you with a local, top-rated REBNY Member Brokerage who will list you in your local inter-broker listings database as well as popular search websites such as StreetEasy, Zillow, Trulia and Brownstoner. You will be copied on or forwarded all inquiries so you can directly manage the sale process. Pay commission only if you decide to close with a represented buyer. Pay nothing more should you close with an unrepresented buyer! The great advantage of selling a coop by owner is the ability to under-price your home without being obligated to pay 6% in broker commissions just because an offer comes in at your listing price! Since you won’t have to sign a traditional 6% commission Exclusive Right To Sell Listing Agreement, you will have the freedom to price your home however you wish without fear of being obligated to pay a broker just because a “ready, willing and able” buyer was found at your listing price. Furthermore, you’ll actually be able to under price your home without being any worse off due to the commission savings from an Agent Assisted FSBO. So not only will you sell your coop faster, but you’ll likely sell it for a higher price due to the competitive atmosphere that comes with an attractive list price. This is the biggest problem for most NYC home owners because most people cannot afford to take time off from work to show their apartment in the middle of the day. However, being available daily at all reasonable hours to show your apartment will be critical to a successful sale. As we’ve alluded to before, many international buyers are only in town for one or two days and have busy schedules packed with showings. Often times, there is only one specific time available on their schedules to see your apartment. So if you’re serious about selling your home for the highest possible price, make sure you’re free to show your own apartment! Getting a good real estate attorney is important for any transaction in New York City, but especially so if you’re selling your coop by owner. A good real estate attorney won’t simply rush you through the contract and rush you to sign. A good real estate attorney will advise you about various scenarios where the buyer can walk away from the contract if there are contingencies in the contract. A good real estate attorney will explain disclosures and answer your questions around the closing process. A good real estate attorney will give you an exact breakdown of expected closing costs. You can immediately tell if the buyer has a good real estate attorney if he or she actually thoroughly diligences the building financials and board meeting minutes. If it is new construction, the lawyer will advise the buyer to get a home inspection. Even if it is a re-sale, a good attorney could suggest a home inspection before signing the contract. Sure the buyer is bound to get complaints from the listing agent about how an inspection is highly unusual for a co-op transaction, but the inspector will check for mold and make sure the outlets and appliances work. Keep in mind a home inspection is a visual inspection. A home inspector cannot take apart appliances or look inside walls at plumbing and wiring. You’ll have to push the buyer or buyer’s agent to quickly sign the contract if you want to get a deal locked in fast. If you’ve underpriced your listing, then you will have more leverage over your buyer as you should have multiple offers waiting to be accepted. An additional benefit of selling a coop by owner is that you avoid a typical conflict of interest for listing agents: once they have a serious offer they don’t want to continue spending time showing it. It makes sense from the agent’s perspective, why keep showing if you already have a good deal? The marginal benefit to an agent of a slightly higher offer if they continued showing is minuscule. While $10,000 more on a better offer is significant to the owner, it only represents $300-600 more in commission for the real estate listing agent. Since you are selling by owner, you’ll need to handle this negotiation and salesmanship yourself. If you find it to be too challenging, perhaps consider our 1% for Full Service listing option so a professional can manage the entire process on your behalf. Is your board relatively relaxed? Is your co-op an income restricted (i.e. HDFC coop) building? Or is your co-op board extremely uptight and nitpicky? These are all important considerations for your buyer to know as he or she completes the purchase application and prepares for the board interview. It’s important to have your buyer first read a tutorial on how to prepare a co-op purchase application so they will know basic tips like a purchase application must be typed versus handwritten. Afterwards, you simply need to make sure they follow the instructions of the purchase application, include signed originals as well as collated copies, have supporting financial statements match the financial summary and so forth. Congrats on getting the deal in contract! The next step is to complete this purchase application (“board package”). Please take a look at this article (https://www.hauseit.com/nyc-coop-board-package-purchase-application/) for important tips on how to go about it (e.g. must be typed). The listing agent mentioned the purchase application can only be submitted to the management company the 1st Tue of each month. So that means Jan 3. Do you think you can get a loan commitment by then? If not then the next date will be Feb 7. The board then meets the 3rd Tue of each month to make a decision. We get an answer the next morning and if you pass then there’s a board interview the following week. Please mail us all of the required original docs (i.e. reference letters, net worth affidavits, etc) and you can create a Google Drive folder and upload all the files there as well (tax returns, bank statements, pay stubs, etc). Thank you! Blank pages (i.e. of statements) should be included. Letters should be signed and original. You should write a nice introduction letter. The board reads every word so attention to detail is important.